I’ve recently been gripped by retro-gaming nostalgia. 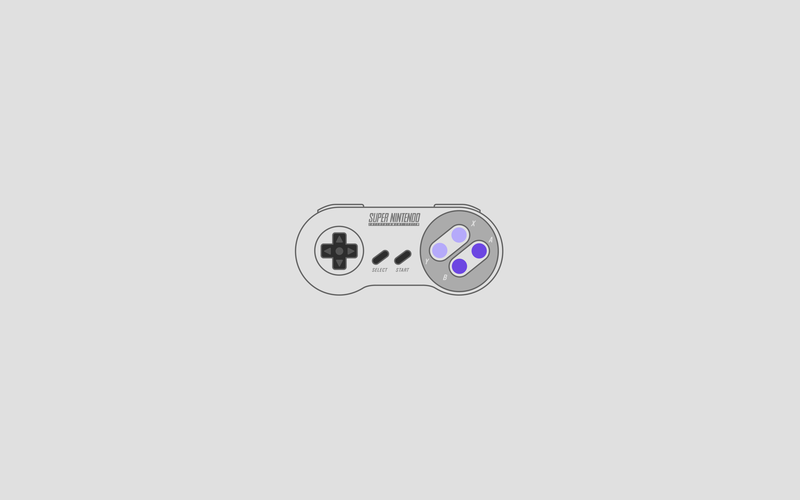 First, I wrote about playing classic Nintendo games on your Mac, then I made some SNES-themed wallpapers for iPhone 5, and then some NES-themed ones too. Now, I want to share some Super Nintendo controller wallpapers with you, for your Mac or PC (or iPad and iPhone, if you crop/resize them yourself). 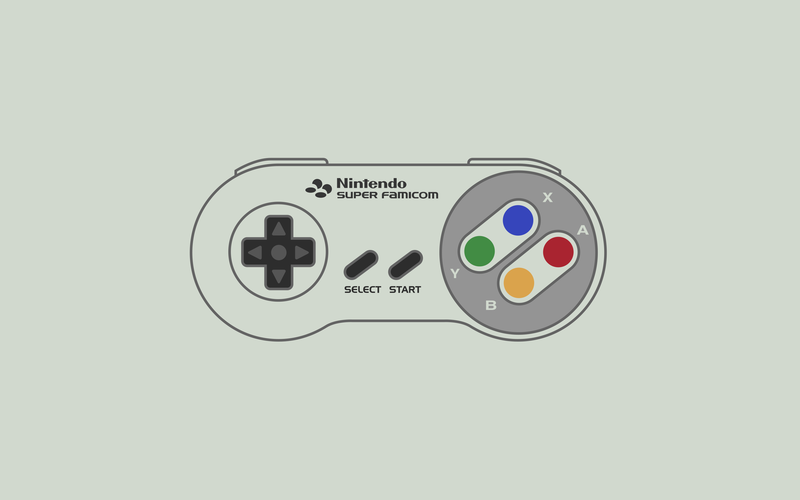 There were three different primary models of SNES controller: the Japanese (Super Famicom) version, the European Super Nintendo version, and the American Super Nintendo version. 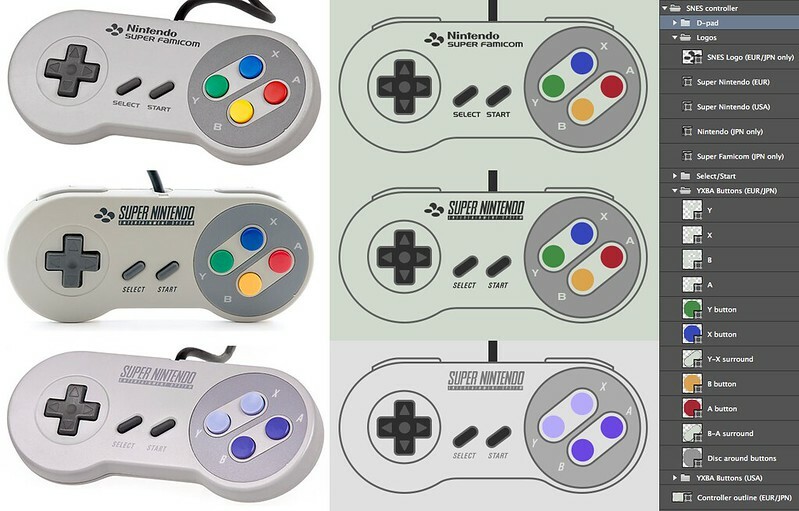 The Japanese and European ones looked almost identical, differing only in the logo and the font used for the labels of the “Start” and “Select” buttons, but the American version had several more changes. It shared the Start/Select label-font of the European controller (albeit in a lighter colour), but almost all of the plastic parts were a different colour from the other two versions. It also lacked the Super Famicom crescents-and-discs logo, and instead of the Y/X/B/A buttons being green, blue, yellow and red respectively, they were instead paired: Y and X were a soft lilac shade, and B and A were a darker purple. 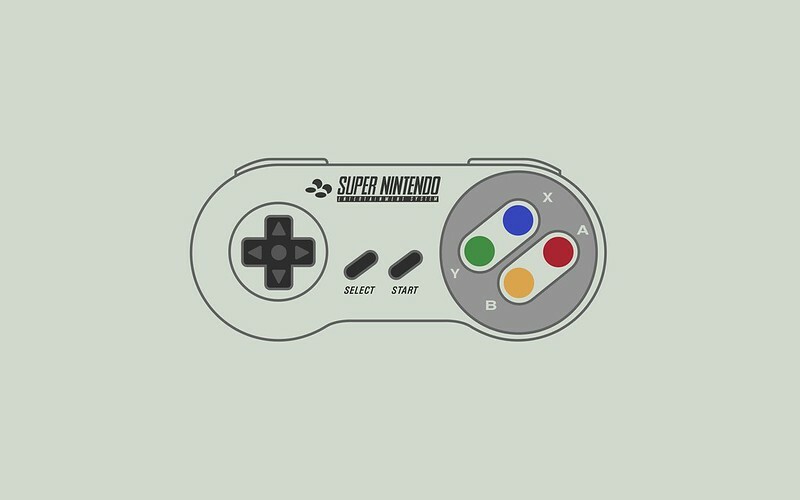 Uniquely, the Y and X buttons were also concave, like the B/A buttons on the original NES, and the Y/X/B/A labels were in a different (narrow, italicised) font. 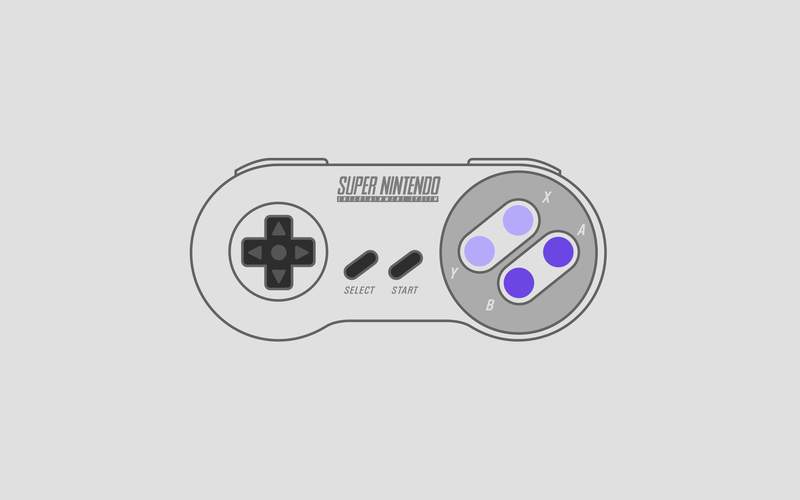 I drew all the various parts of the Super Nintendo controllers in Photoshop CS6, taking account of the differences between models and using Layer Comps to display each different model. These wallpapers are based on that master Photoshop document, and are available in a set on Flickr. I’ve created three basic versions: full, simplified (no text), and abstract (no actual controller outlines). 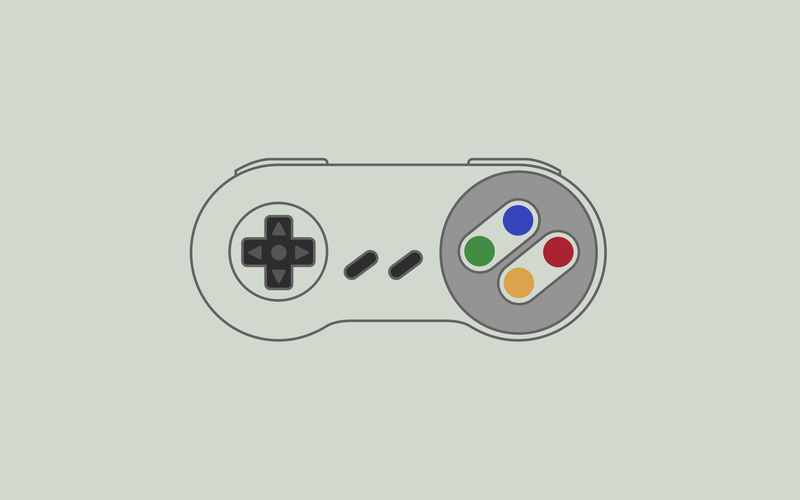 Where appropriate, you can choose from all regional variants of the controller. The wallpapers are 2880 x 1800 pixels, and each come in two editions: regular, and Retina Display. 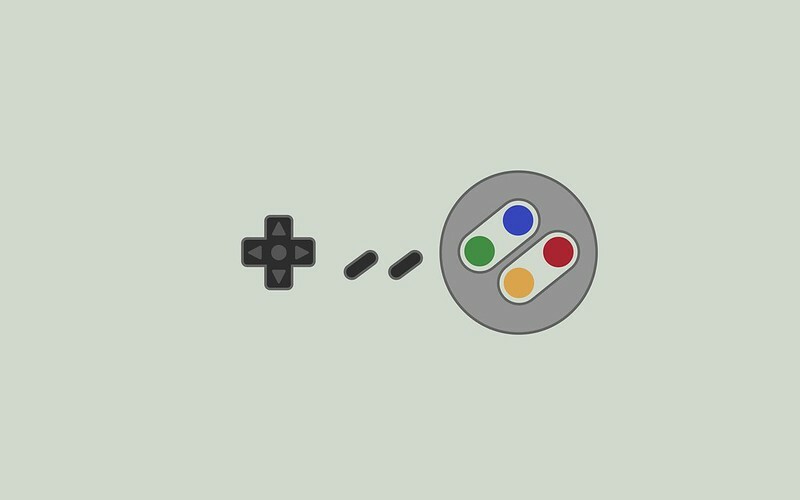 The pixel-resolution is the same in both cases, to allow you to crop/resize both editions as you wish, but on the Retina versions the actual controller graphics are doubled in size for extra detail and smoothness. If you prefer bigger graphics, you can of course use the ‘Retina’ versions on non-Retina devices too. If you use the non-Retina versions on smaller-screened devices, you’ll probably want to centre them, rather than scaling to fit the screen. That’s fourteen choices. I’m sure you can imagine how much fun these were to export from Photoshop (not too much fun at all). Please do not redistribute these wallpapers in any form. They’re for your personal use only. If you want to use them for any other purpose (such as including them on a website, as elements in another design, any profit-making enterprise or anything other than personal use on your own devices), then please contact me first. This version has all visual elements present (minus the cable; I didn’t think you’d want it snaking across your desktop). Download Full - Japan (Retina). Download Full - Europe (Retina). Download Full - USA (Retina). 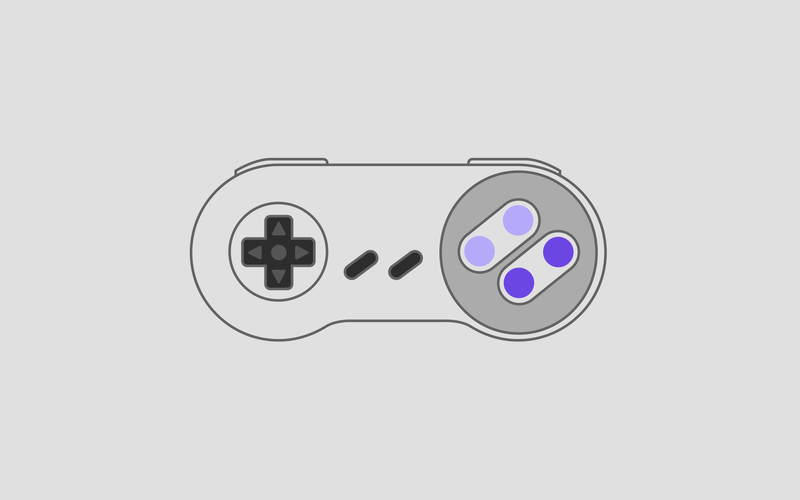 For this version, I’ve hidden all text, labels and logos, to convey just the essence of the controller. There are only two variants instead of three, because with all textual and logo elements removed, the Japanese and European models are identical. Download Simple - Japan/Europe (Retina). Download Simple - USA (Retina). Finally, this version removes any strong outlines (except the lovely disc around the Y/X/B/A buttons), including the controller casing/border itself. It’s just buttons floating in a solid-coloured background. To me, this one says “retro gaming”. Again, there are only two variants since there’s no distinction between Japanese and European models at this level of abstraction. Download Abstract - Japan/Europe (Retina). Download Abstract - USA (Retina). I’m @mattgemmell on Twitter, and also on app.net. You should follow me. If you enjoyed these free wallpapers and want to feed my gaming habit (or something else), I have an Amazon UK wishlist.